Wordle creates a "word cloud" out of any text you want. It's a little clunky to use. You can't save your word cloud--you can only take a screen shot of it. If you click off the screen you're working on you lose everything. Once you enter your text you can't change it without starting over. That said, you can get a fun little graphic if you're patient and careful. 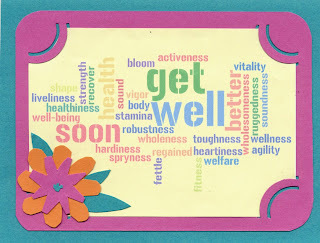 My Get Well card started with words pulled from a thesaurus. I suggest you copy and save your words because believe me, you will mess up and find yourself back at the beginning, cursing. On Wordle, go to Create. Enter your text in the text box. If you want some words to be larger, enter them several times. The more times you enter the word, the larger it appears. It does not appear multiple times. Click "go". Under the Language tab you can change to all uppercase, all lowercase, or leave the words as entered. Choose a font from the Font tab. Unfortunately, you just have to try them out, there is no preview of the fonts. Go over to Layout and decide which direction(s) you want to words to run. Now go to Color and set up your color palette. Click on Edit Custom Palette to make your own. A new window will open with a background color and four word colors. Double click on any color swatch to select a new color. Once you have your colors set you can click Recolor until you like the color combination on the words. You can also add a little variety by selecting one of the Variance choices at the bottom. Go back to the Layout tab and click on "Re-layout with current settings" if you want to change where the words appear on the page. If you get one you think you like, but aren't sure, take a screenshot, because you can't come back to it. Satisfied? Press that "Print Screen" button. Your wordle is now on your clipboard. You need to open up any picture editing program and Paste the screenshot, then save the document.